E. and J. Burke were the brothers, Edward Frederick Burke (1827?-1887) and John Burke (1829-1892). They were Irish distillers, brewers, bottlers and (in New York especially) importers. They were in business in New York City from 1874 to 1953. The building at 616 W. 46th St. was built by the company to serve as headquarters and storage. A six-story brick warehouse, it was designed by the architect, Thomas J. Duff, constructed in 1912-13, and housed E. & J. Burke from 1913 to 1922. A summary of the early history of E. & J. Burke can be found at http://bulk.resource.org/courts.gov/. The date of this information seems to be early 1900s: "The complainant is, and at the time of the commencement of this suit was, a corporation organized and doing business under the laws of the Kingdom of Great Britain and Ireland, and for many years has had, and now has, a place of business in the city of New York, U. S. A. Its business is that of export bottlers of stout, ales, whiskies, and other goods. It is the successor in business of the firm of Edward & ]ohn Burke, composed of Edward Burke, John Burke, and John Gardner Nutting. In 1870 that firm was the sole export bottlers for the United States of the stout brewed by Arthur Guinness, Son & Co., Limited, and they continued to be such sole export bottlers of such stout until 1874 or 1875. For about 50 years the complainant and its predecessor have exported to the United States this Guinness Stout in bottles bearing labels and capsules in the following style, dress, and collocation (with some insignificant alteration of detail), viz. : The bottle itself is of the shape and size of the ordinary lager beer or beer bottle. On one side is an oval label with the picture of a small harp thereon (trademark), such label bearing the words, in large print, 'Guinness's Extra Stout, James Gate, Dublin,' and, in small type, the words, 'Printed and issued by us as our trade-mark and label, Arth Guinness, Son & Co.,' a number printed in large red figures, and also, in small type, the words 'Bottled by E. & ]. Burke, Limited, Dublin, Ireland, who sell no other brown stout in bottles.' Below this, and attached horizontally, is another oval label of the same color bearing the words: 'Guinness' Extra Foreign Stout, Dublin. We the undersigned guarantee and hold ourselves responsible that we bottle none other than Guinness's Finest Foreign Stout which we have continuously done for past half century. Edward & John Burke, Limited. Established in Dublin in 1849.'" In 1922/23 Burke relocated to Long Island City. They seem to have had at least three locations in Long Island City. This notice appeared in the New York Times, 12 May 1933, "E. J. Burke, Ltd., of New York, Dublin, London and Liverpool, importers and bottlers of Bass's ale and Guinness stout, have bought an entire block on the Degnon Terminal from the George A. Fuller Company bounded by Skillman Avenue, Twenty-seventh to Twenty-eighth Street and Nelson (Forty-seventh) Avenue. The site fronts 245 feet on Skillman Avenue and 358 feet on Twenty-eighth Street. The buyers plan to erect a six-story fireproof building for bottling and warehouse purposes ..." This Guinness sign is located at the 1933 facility. This is just one block away from a later Burke brewery and distribution center at 47-24 27th St. Apparently E. & J. Burke was taken over by Arthur Guinness Son & Co., and the later building was used to brew Guinness stout in the U. S. sometime in the 1940s. This account appeared in the New York Times, 14 June 1949, "Henceforth, Guinness's stout for American consumption will be brewed exclusively in the United States, it was announced yesterday by Arthur Guinness Sons & Co., Ltd., Dublin, Ireland. The recently acquired brewery of E. & J. Burke, Ltd., in Long Island City, Queens to which a large addition is now under construction, has been named the Arthur Guinness Son & Co., Inc., brewery and will be used for this purpose ... E. & J. Burke, Ltd., which has handled the distribution of Guinness stout in the United States for eighty years, will continue to act as prime distributors of the product brewed here." A biographical sketch of John Burke appeared in America's Successful Men of Affairs; An Encyclopedia of Contemporaneous Biography, edited by Henry Hall, vol. I, The New York Tribune, 1895, "John Burke, agent for the Guinness ales and porters, born in County Galway, Ireland, Aug. 7, 1829, died Feb. 4, 1892. He was a son of the Rev. John Burke. The boy received an excellent education, although never sent to college. He studied law under private tutors, but did not practice, joining instead his brother Edward in distilling liquors. After mastering the details of business, he went into partnership with his brother, and helped found the now well known firm of E. & J. Burke, of Dublin, whose Irish whiskey soon became known all over the world. Later, the firm began the bottling of Bass's ale and Guinness's porter. Both men were energetic and shrewd and met with great success. They maintained branches in Liverpool, New York and Australia, and finally transacted so large a trade with America that, in 1859, John Burke came to New York to take charge in this country, under the name of The E. & J. Burke Bottling Co. The parent house finally took the name of E. & J. Burke, Ltd. Edward Burke died about 1889, leaving his entire fortune to John. The latter built the Burke pavilion at the Orange Memorial Hospital in honor of Edward's memory, at a cost of $30,000, adding $16,000 as well as $10,000 for the Hospital afterward. John Burke was a man of warm feelings and generous nature, and gave largely to public and private charities. He was twice married, his second wife being Elizabeth West, daughter of the Rev., John Watson, of Orange. His children were John Burke, jr.; Mrs. Moor, a resident of England; Edward F., Mabel and Edith L. Burke." The building at 616 W. 46th St. was described as follows in an environmental impact statement prepared for the New York City Dept. 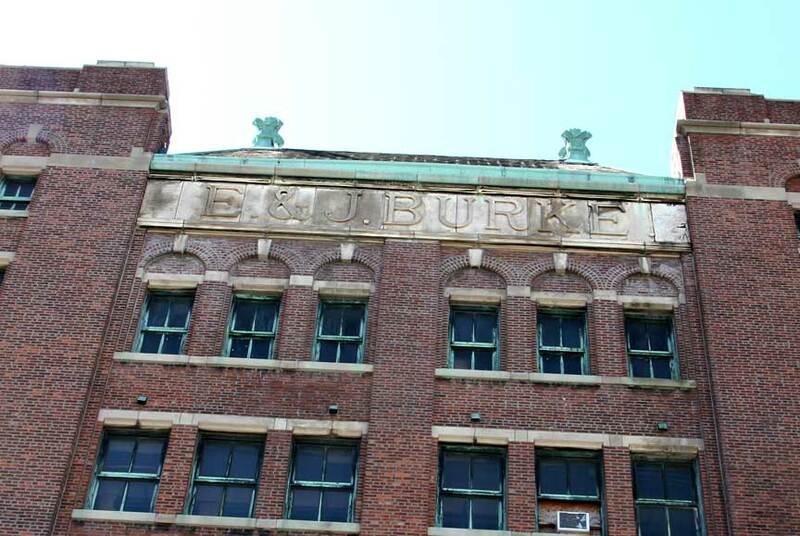 of Housing Preservation & Development in 2010, "The six-story red brick E & J Burke Company warehouse (S/NR-eligible) at 610-620 West 46th Street was built in 1912-1913 for the E & J Burke company, an importer and seller of beer and whiskey ... It was designed by architect Thomas J. Duff who was the architect of several churches in Manhattan, including the 1908-1909 Franciscan Father Monastery that is part of the St. Francis Roman Catholic Church Complex at 129-143 West 31st Street and St. Malachy's R. C. Church at 239-245 West 49th Street. The building's four-bay-wide fa�ade has street level loading docks, two end bays that project slightly forward from the two center bays, and regular fenestration with historic two-over-two double-hung sash. The parapets of the end bays extend above the center bays. A stone panel inscribed with the words "E & J Burke" spans the top of the center bays. Two copper finials extend above the roof."